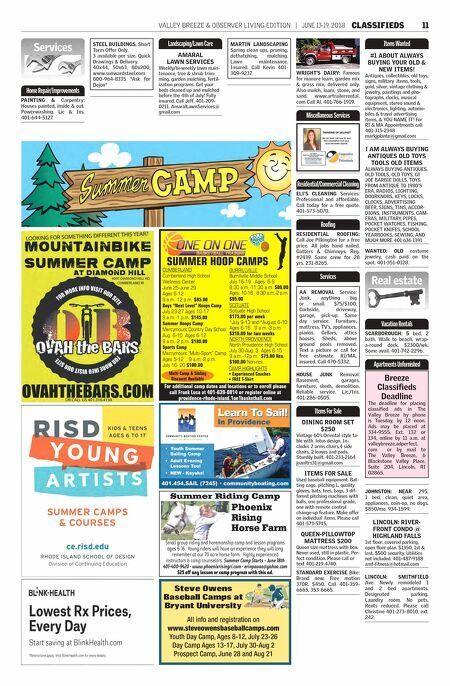 10 CLASSIFIEDS JUNE 13-19, 2018 | VALLEY BREEZE & OBSERVER LIVING EDITION 1097 EddiE dowling Hwy., nortH SmitHfiEld, ri 02896 401-762-4200 • www.route146autosales.com Servicing all makes & models Specializing in trucks & diesel repairs Fleet Service Welcome! Special Commercial Rates to SAVE your business money! Full SERViCE FACility: • All Major and Minor Engine Repairs • Exhaust Manifolds • Differential Rebuilds • Diagnostics with state of the art equipment • Computerized Alignments • And so much more! 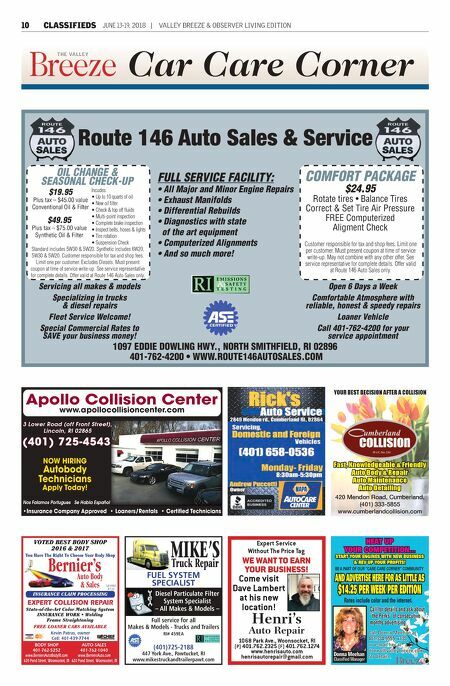 Route 146 Auto Sales & Service Open 6 Days a Week Comfortable Atmosphere with reliable, honest & speedy repairs Loaner Vehicle Call 401-762-4200 for your service appointment $19.95 Plus tax – $45.00 value Conventional Oil & Filter Standard includes 5W30 & 5W20. Synthetic includes 6W20, 5W30 & 5W20. Customer responsible for tax and shop fees. Limit one per customer. Excludes Diesels. Must present coupon at time of service write-up. See service representative for complete details. Offer valid at Route 146 Auto Sales only. COMfORt PACkAgE $24.95 Rotate tires • Balance Tires Correct & Set Tire Air Pressure FREE Computerized Aligment Check Customer responsible for tax and shop fees. Limit one per customer. Must present coupon at time of service write-up. May not combine with any other offer. See service representative for complete details. Offer valid at Route 146 Auto Sales only. OiL ChAngE & SEASOnAL ChECk-uP $49.95 Plus tax – $75.00 value Synthetic Oil & Filter Incudes: • Up to 10 quarts of oil • New oil filter • Check & top off fluids • Multi-point inspection • Complete brake inspection • Inspect belts, hoses & lights • Tire rotation • Suspension Check VOTED BEST BODY SHOP 2016 & 2017 State-of-the-Art Color Matching System INSURANCE WORK • Welding Frame Straightening FREE LOANER CARS AVAILABLE You Have The Right To Choose Your Body Shop INSURANCE CLAIM PROCESSING EXPERT COLLISION REPAIR Kevin Patras, owner Cell: 401-439-7744 BODY SHOP 401-762-5252 AUTO SALES 401-762-1040 www.BerniersAutoBodyRI.com 620 Pond Street, Woonsocket, RI www.BerniersAuto.com 620 Pond Street, Woonsocket, RI License #135 Bernier's Auto Body & Sales Mike's Truck Repair FUEL SYSTEM SPECIALIST Diesel Particulate Filter System Specialist – All Makes & Models – (401)725-2188 447 York Ave., Pawtucket, RI www.mikestruckandtrailerpawt.com Full service for all Makes & Models - Trucks and Trailers RI# 459EA Expert Service Without The Price Tag WE WANT TO EARN YOUR BUSINESS! 1068 Park Ave., Woonsocket, RI (P) 401.762.2325 (F) 401.762.1274 www.henrisauto.com henrisautorepair@gmail.com Henri's Auto Repair Come visit Dave Lambert at his new location! Car Care Corner 420 Mendon Road, Cumberland, (401) 333-5855 www.cumberlandcollision.com Fast, Knowledgeable & Friendly Auto Body & Repair Auto Maintenance Auto Detailing YOUR BEST DECISION AFTER A COLLISION 3 Lower Road (of f Front Street), 3 Lower Road (of f Front Street), Lincoln, RI 02865 Lincoln, RI 02865 •Insurance Company Approved • Loaners/Rentals • Certified Technicians www.apollocollisioncenter.com Apollo Collision Center Nos Falamos Portugues Se Habla Español NOW HIRING Autobody Technicians Apply Today! (401) 725-4543 (401) 725-4543 Call for details and ask about "the Perks" of consecutive months advertising. Call Donna Meehan at 401.334.9555, x133 or e-mail her at donna@valleybreeze.com for details. Donna Meehan Classified Manager HEAT UP YOUR COMPETITION… START YOUR ENGINES WITH NEW BUSINESS & REV UP YOUR PROFITS! BE A PART OF OUR "CARE CARE CORNER" COMMUNITY AND ADVERTISE HERE FOR AS LITTLE AS $14.25 PER WEEK PER EDITION Rates include color and the internet.